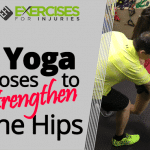 I wanted to show you a few effective new hip strengthening exercises. I had Jenna to demonstrate the exercises. Begin in a nice, upright standing position. Shift your weight onto one leg with your knee is slightly soft. Lift the other leg out to the side, and then go back to the starting position. When you lift the leg out to the side, minimize the pelvis movement. Lift the leg from 0 degrees to about 45 degrees. 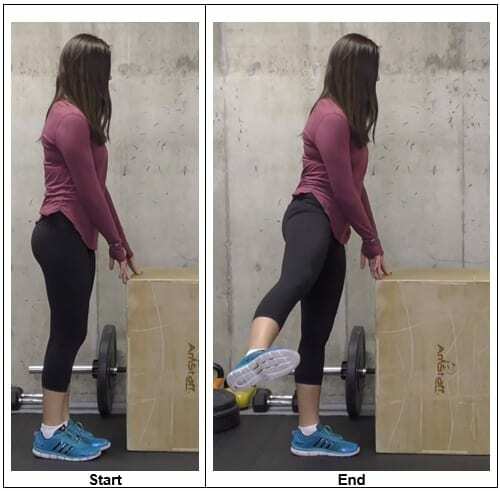 This exercise focuses on strengthening the outer part of the hip. Start with one set of 5 reps on each leg. Perform this exercise in smooth, controlled movement with a good stop at the end position for about a second. The intensity can be light to moderate, focusing on the outer part of the hip. 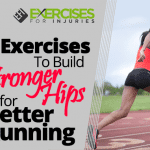 Looking at hip strengthening, we need to target all the different aspects of the hip not just the easy movements or the movements that you are strong in, but all directions and different muscles of the hip. 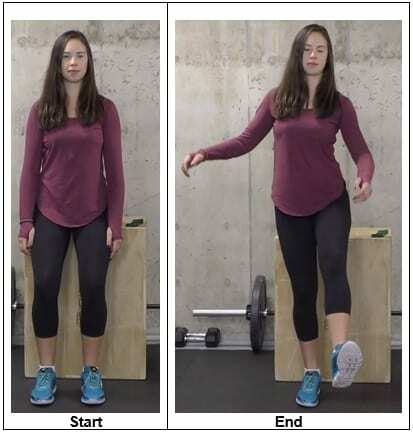 For this exercise, you can use a chair or plyometrics box. Begin in a nice, upright sitting position. Relax your upper body, and have your feet are both hip-width apart. 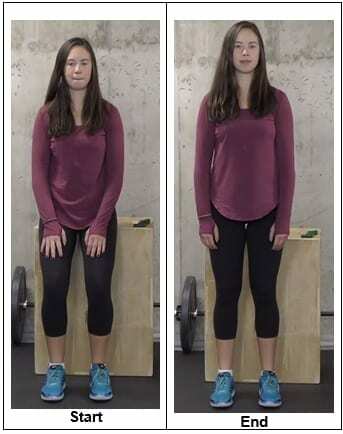 Move into a standing position, and then go back to the sitting position. With the double leg, we’re focusing mainly in the forward direction with the movement. We are targeting the hamstrings and glutes, which are the posterior part of the hip. If that is too easy for you, you can do it with a single leg. When you go with the single leg, it’s more challenging because you have to work on the stability of the foot and the side-to-side stability and rotation of the knee. Looking at the hip, you are working on its stability. We’re working on strengthening the forward direction and stabilizing the outer part of the hip and its rotation. Start with one set of 3 reps. Perform this exercise in smooth, controlled movement with a quick stop at the end position. The intensity can be light to moderate, targeting the glutes and hamstrings areas when you do the bilateral movement. Going from the double leg to a single leg is an excellent a progression to have. Lie on your back on the floor. Relax your upper body and put arms to the side. Bend one knee and extend the opposite leg and lift it up, hold it for a couple of seconds, and then bring it back down. Start with one set of 5 reps on each leg. Perform this exercise in smooth, controlled movement with a good quick stop at the top position. The intensity can be light to moderate. This exercise focuses on the front part of the hip carrying over to the quads targeting the hip flexors. Lie on your side on the floor. Rest your head on one arm. Keep a good alignment with your spine. Bend your lower body slightly to prevent you from rotating or from not staying in a side lying position. Lift the top leg to about 45 degrees, hold it for a couple of seconds, and then bring it back down. Repeat the movement. Start with one set of 5 reps on each side. Perform this exercise in smooth, controlled movement with a good stop at the top position for about a second. The intensity can be light to moderate. 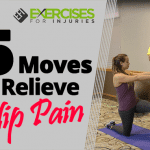 This exercise targets the outer part of the hip. For this exercise, you use a resistive tubing. Put the band just above the knees. Separate the knees with a little bit more than hip-width apart so that you will be in a good squatting position and toes are pointing out. Go through the squatting movement, squat down and go back to start position. The resistive band challenges the hip and targets the whole hip area. Start with one set of 5 reps. Perform this exercise in smooth, controlled movement with a quick stop at the bottom position. The intensity can be light to moderate. This is a terrific exercise because it targets the posterior part of the hips, hamstrings and glutes. With the use of the resistive band, you are targeting the outer part of the hip and the rotation of the hip. These are the five exercises that you can do to strengthen up your hips. 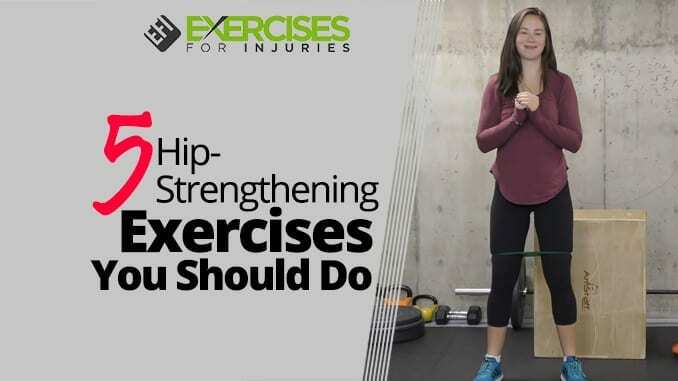 Make you sure to give these hip strengthening exercises a go and work your way to having strong hip flexors. 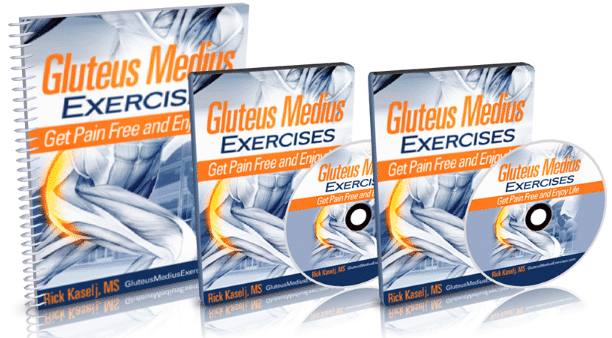 If you want to overcome or prevent back and lower body injuries, then check out the Gluteus Medius Exercises program.